Experience some of Western Australia’s unique natural and cultural gems on this fascinating full-day tour from Perth. Drive through scenic Swan Valley and wander among the otherworldly limestone stacks of Pinnacles Desert. Discover a little-known slice of Australian history at New Norcia’s Benedictine Abbey, where you can browse sacred artifacts and buy unique handmade goods. Savor a delicious fish and chips lunch and, in springtime, admire fields of blooming wildflowers. Western Australia is a tapestry of diverse landscapes and rich Aboriginal and European history. This full-day tour begins with morning pickup at your Perth hotel and a drive through scenic Swan Valley, the historic suburb of Guildford and the citrus-growing region of Bindoon. Listen to onboard commentary from your guide along the way, and make your first stop at New Norcia. Learn about the history of the town, which was first established in 1846 as a mission to the Aboriginal community and is home to Australia’s only Benedictine Abbey. Tour the town with a local guide, and visit a museum housing gifts presented to the abbey from various popes and Spanish royalty. You’ll have a chance to purchase unique goods handmade by the monastery, such as olive oil, nut cake, fruit wine and fresh-baked bread followed by a Fish and Chips lunch at the New Norcia Hotel. Next, we visit the Western Wildflower Farm for a brief educational talk about wildflowers. 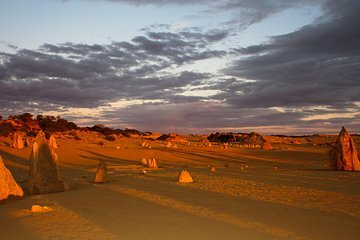 We then explore otherworldly landscape of Pinnacles Desert in Nambung National Park, where you can walk among the mystical limestone stacks scattered throughout sandy dunes. Snap photos of fragrant wildflower fields (August to December only), and stop at a store featuring bouquets of dried flowers in all seasons. Relax on the return drive down the coast to Perth, where your full-day tour concludes in the evening.